The longest day of the year has come and gone for those of us in the northern hemisphere. I've gone swimming not once, not twice, but THRICE this week. (Put my body in water; it's where I belong.) I've been buying fudgsicles from the corner store on my walk home from work. To some, this might mean summer is finally here. To me, it means that the annual Steam summer sale is now underway. It's that beautiful time of year when all the games on one's wishlist finally feel like they're in financial reach. Sure, I might not get to some until winter rolls around, but at least I'll have them when the nights start getting longer. Age of Empires II (75% off; $5): Age of Empires hold a certain place in my heart. It was one of the first games I played almost daily. A childhood friend of mine had the first Age of Empires on her dad's computer. The only catch was that it was in Italian. But that didn't deter pre-teen me: I was quickly sucked in to the resource management, the army building, and the intricate strategy of the game. Honestly, I'm not that great at Age of Empires; I've never been very good at planning ahead. But even as my village is crushed by an opponent's army again and again, I find it deeply satisfying. I build. I hope. I repeat. 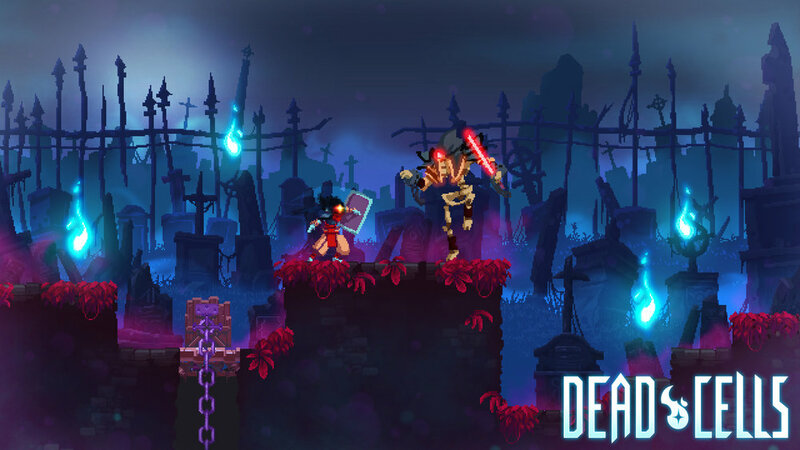 Dead Cells (15% off; $14.44): Dead Cells is still in its early access stages, but it's received quite a lot of positive press. It came on my radar after Polygon posted a short playthrough video. Roguelikes are not usually up my alley, what with their fast pacing and permadeath. Both of those usually spell out instant anxiety for this gentle gamer. However, this looks like a load of fun. The sheer variety of options, along with some delightful ways to combine elements/attacks, somehow alleviates my nervousness. If the game is about just throwing things at the wall and seeing what sticks, I can deal with that. The likelihood that I'll get nervous and throw my controller across the room is, admittedly, still pretty high. I'll likely grab a friend and cheer them on as they dungeon crawl to their heart's content. Shelter 2 drew me in with its idiosyncratic design. Everything looks like a paper cutout. The sun is a big swirling ball of yellows. It feels like nature, but nature through the eyes of something else. This makes sense, since the player controls a lynx trying to survive in the world and raise a litter of kittens. Pursuing user reviews, it seems like this game might tug on the heartstrings a little. As someone who regularly cried over pictures of cats available for adoption from the SPCA, I can't wait to become a blurbing mess over 3D rendered felines. Kentucky Route Zero (50% off; $12.49): OK, so I already own Kentucky Route Zero. I've played it over at least four times, but I'm including it here anyway because you now have no excuse not to play it. It's the best game I've ever played (and was the first I wrote about on Gentle Gamers). It's a perfect package and does things I've never seen other games do. With its themes on debt, ghosts, and Americana, I can't imagine a better time to spend an evening on the Zero. Stardew Valley (40% off; $8.99): Gentle farming sim that lovingly held me in its clutches for 100+ hours. Review here. Everything (34% off; $9.89): Game that breaks the idea of what a game can and should be. Proper review forthcoming, but for now, you can read my ode to David OReilly here. Papers Please (60% off; $3.99): A game that, using the simplest of mechanics, will make you challenge your humanity and morality. Review here. The Witness (50% off; $19.99): The most furious you will ever be at a series of lines and dots (contained within the most beautifully rendered world). Review here.